More pre-production meetups in the Acro Camp community! 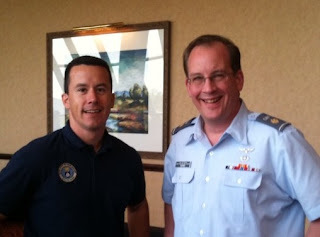 Director Steve Tupper met up with camper Jim Rodriguez at Civil Air Patrol’s National Legal Officer College near Dallas, Texas yesterday and today. As many know, Jim is an Air Force Reserve major and judge advocate. He also serves CAP as, in addition to other capacities, a legal officer. Tupper is a CAP major and serves as the Michigan Wing’s assistant legal officer. NLOC is usually held in alternate years at locations that rotate around the country. Over the course of three days of training and team-building activities, about a third of CAP’s 150+ legal officers receive training and updates on the wide range of legal issues that confront CAP daily.